For my purposes, I downloaded the Mandriva One live CD. After putting the CD in my computer and starting it up, Mandriva started right up (as it should with a live disc) and I was off and running. I then double-clicked on the “Live Install” icon on my desktop, which launched the Mandriva installer. After a bit of configuration, I had Mandriva installed in my VirtualBox virtual machine. One thing I noticed right away was that Mandriva supported the VirtualBox add-ons out of the box. 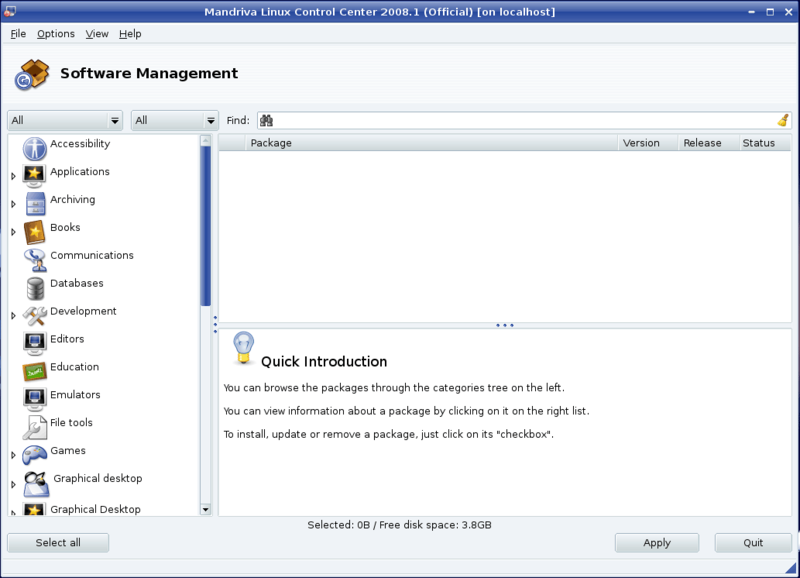 Unfortunately, the VirtualBox add-ons that come with Mandriva 2008.1 are for VBox 1.5, and I am running VBox 1.6.2. That wasn’t a huge deal, and apparently isn’t a problem for everyone. However, for me, it seemed to stop me from being able to mount a shared drive through VBox. After a single post on Mandriva’s support forums, though, I had immediate help from an RPM developer, who put together an RPM of the VBox 1.6.2 add-ons just for me, and eventually led me through the steps I needed to take to get them installed properly (it turned out that I had multiple conflicting versions of the VBox kernel installed, which were keeping the add-ons from working properly). As mentioned above, Mandriva comes pre-configured for KDE 3. The desktop is very attractive and easy to use. There is nothing really abnormal or special about the Mandriva desktop that’s different from any other KDE desktop. However, the desktop is nice and clean from installation, and is easy to use. 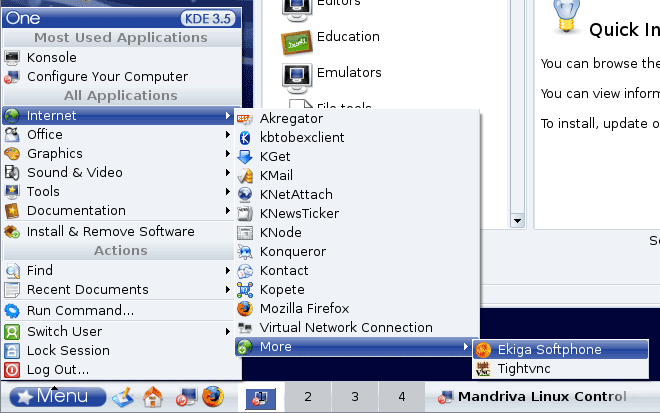 Using KDE 3, Mandriva allows you to easily add shortcuts and documents to the desktop whenever you need to. It also allows you to easily add new panels to the desktop, so that you can create a separate panel similar to the “quick launch” used in Windows and more. You can also add nice little widgets and applications to your desktop. The one really nice thing about the Mandriva desktop and the configuration of Konqueror (the file manager/browser used within KDE Linux environments) is that they are configured, by default, to utilize the double-click behavior that most Windows users are familiar with. Normally, the default behavior of KDE is to use single-clicks to open or activate files and items on the desktop or in the file browser. 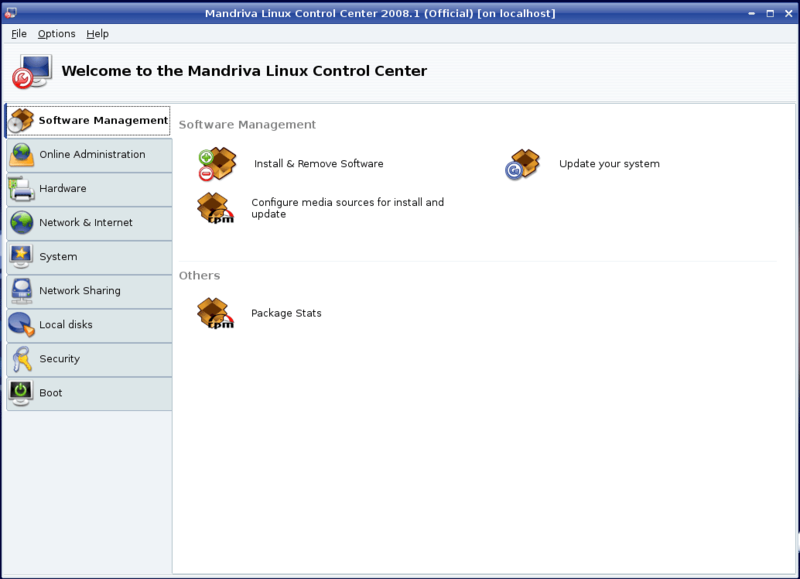 Mandriva Linux uses an application called the Mandriva Linux Control Center (formerly drakconf or the Mandrake Control Center) to configure the system. Similar to the YaST module used in OpenSuSE (and the configuration modules used in many other Linux distributions), MCC is divided up into logical categories. Personally, I think Mandriva’s Control Center is divided into more logical categories than that of OpenSuSE. For one thing, there is no “miscellaneous” category. 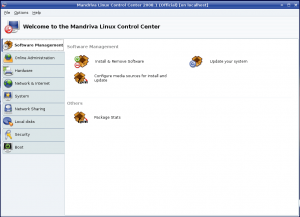 Mandriva has found a way to categorize everything that’s included in its control center. What’s even nicer about Mandriva’s control center is the fact that it uses plain English descriptions of the items inside. For instance, in the “Network Sharing” category, rather than simply using an icon that says “SMB share” or something similar, Mandriva uses the verbiage “Access Windows (SMB) shared drives and directories”. It seems to me that Mandriva has been developed with Windows users in mind (there is even a migration wizard built in to the software to help Windows users migrate their documents and settings from Windows into Mandriva). It is intended to be very friendly for new Linux users, and I believe the development team has done a great job of doing so. The software installation wizard and the update center could still use a little work, however. When you open the software installation wizard, you will find a comprehensive list of all of the software available from your selected repositories. For power users, this is probably a good thing. However, for new users, this can be extremely confusing and disconcerting. In some other distributions, only the latest versions of each software package are displayed, making it easy to “upgrade” your software without worrying about installing conflicting versions of various applications. The other minor gripe I have about software installation is the icons used to indicate whether software is already installed or not, or to indicate whether a newer version is available. The icons just don’t quite make sense to me, making it difficult for me to determine whether or not I’ve got something installed already. Within the software installation utility, however, the software packages are divided up into logical categories rather nicely, and searching for packages is extremely easy. If I were a Mandriva developer, I would recommend setting up the software installation wizard to show only the latest versions of software by default; and simply make an option to show all versions if you are a power user. The only real issues I have with the update wizard is the fact that it doesn’t really divide the updates into “critical”, “optional”, etc. the way some other update utilities do and the fact that it doesn’t tell you the total download size(s) of the updates you’ve selected. For most broadband users, that’s probably no big deal, but for those of us using satellite connections and for dial-up users, that can be a major problem. Mandriva’s system menus, much like SuSE’s, are divided up nicely. It would be nice if the menu was divided into more subcategories, as things can get a little confusing when viewing the menu (such as the “Internet” tab, which has quite a few entries after a basically default installation). As mentioned above, my experience with Mandriva’s customer support system has been extremely helpful and responsive. I was incredibly impressed by the support I received for the problem I was experiencing, and was amazed that an RPM package was compiled specifically to deal with my issue. 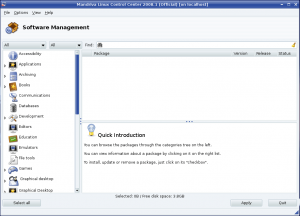 Mandriva is an extremely nice, efficient, lightweight and user-friendly distribution of Linux. Although I have only been using Mandriva for a few weeks, I am incredibly impressed. I am seriously considering switching my allegiance from SuSE to Mandriva, honestly.